DROCON Hacker Drone!! WOAH!! Sweet Deal!! 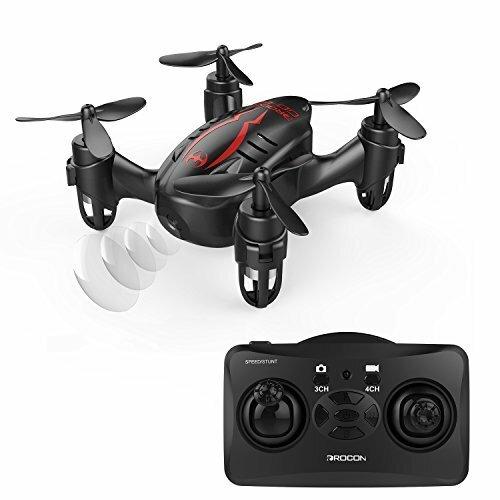 FUN WITH MINI SIZE DRONE - Unlike the other mini drones that are demonstrated for kids or beginners, Drocon HACKER is designed for those who is almost skillful and wish to play a mini size drone for fun even in a narrow room place. 720P HD CAMERA - Can You Believe That ? Even though the drone's size is tiny, it still comes with a built - in HD camera, work with the controller buttons, it is easy to take pictures and videos during the flight. HEADLESS MODE - The Drocon HACKER has added the HEADLESS MODE to help those who are not good at directions, and who just need it for much more fun. Under the HEADLESS MODE, the orientation of the drone will stay constant that makes it is easier to be controlled since there won't be a need to judge which side is the head side. EASY TO TRIM - Unlike the other drones, the Drocon Hacker designs its trim buttons to be much simple with only 4 buttons - Forward/Backward/Leftward/Rightward, and put them all on the center of the controller, that makes it much easier to be understood and controlled, just take a time to adjust the drone and make it to be stable in the air, then it will perform good.